Ambar India – Go There. Try That. 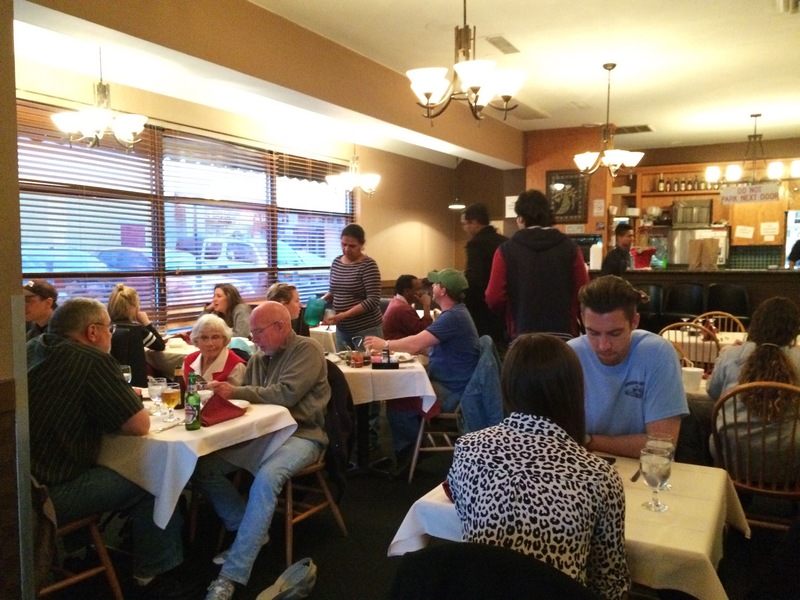 My first encounter with Indian food was at a small place in Dayton. My husband was eager for me to try it, and being open to new experiences, I jumped in. Unfortunately, I decided after that fateful afternoon that I would never ever ever eat it again. But, this blog is all about where TO GO, so I will refrain from sharing the terrible details of that visit. Fortunately, the story doesn’t end there. Ambar rescued me! 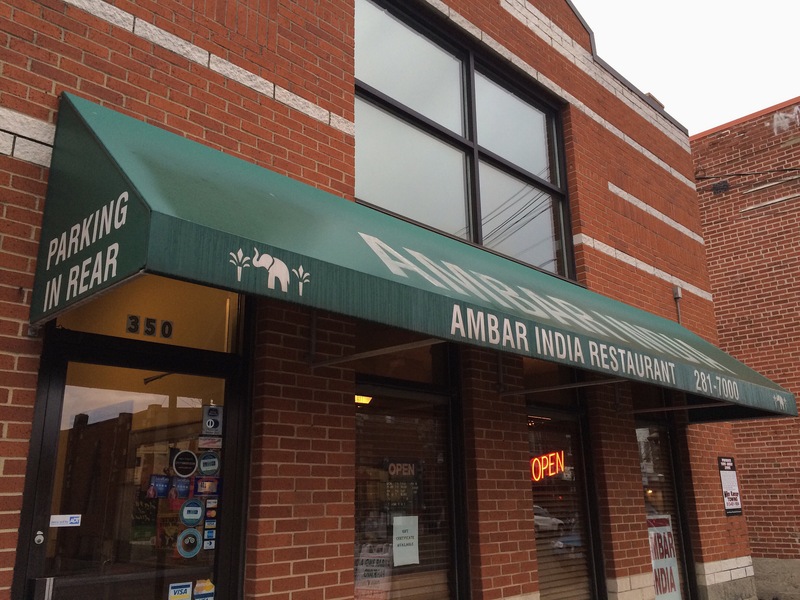 After that evening at Ambar, Indian food became my most favorite of comfort meals. I never get tired of it. And, please know, that when I write about my love affair with Indian, I’m not trying to be an expert in Indian cuisine or regional Indian cuisine. This is a love story between me and Ambar! To start, we always get the Mattu Special. 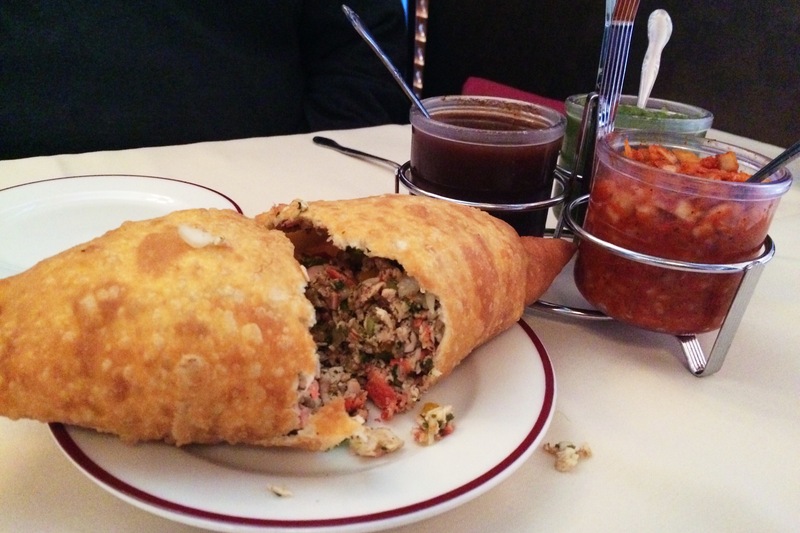 It’s a big pastry, with flakey crust, deep fried and filled with spiced tandoori chicken and diced onion and peppers. Tastes good. Smells good. Feels good. I have friends who are loyal to the samosas, and while I like them, I would always pick the Mattu! Entrees are much tougher to talk about because there are SO many great options. My first choice would be Chicken Tikka. This plate comes out of the kitchen sizzling! The chicken, all white meat, is marinated for hours in yogurt and spices and cooked in a tandoori (clay) oven. The chicken is so tender. It’s served with onion, lemon, and tomato as garnish. Another favorite would be Saag Paneer. If it were up to me, I would never have ordered this dish because it’s cooked with spinach, cream, and cheese cubes, and, well, that doesn’t sound like my thing! I’m so grateful my friends picked this for me because it’s creamy, rich, and satisfying. 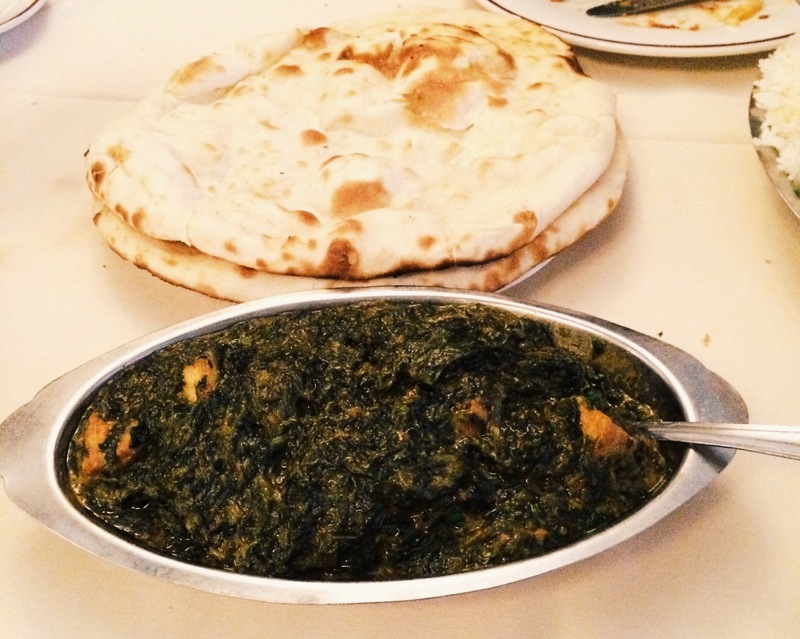 If you’re nervous about the cheese cubes, try Chicken Saag. Same concept, but the cheese is replaced with chicken. My husband’s favorite is Chicken Curry. This is chicken served in a mildly spiced brown sauce, not as creamy and thick as some other dishes. It’s perfect for naan. Naan, leavened flat bread, is ordered separately. There are several types to pick from, but I’d start with plain naan. You can use it in lieu of a fork to scoop up your food and no one will judge. Promise! When someone is new to Indian, and unsure of what to order, I always recommend Chicken Tikka Masala. It’s a staple in any Indian restaurant and I’ve never had a complaint. This creamy, tomato, buttery curry is always gone quickly! Rice is essential with every Indian meal. Rice comes with, so no need to order. But, if you get low on rice, just ask for more and they will bring it! Ambar serves basmati rice made with ghee and saffron. My mouth is watering as I type. Ambar’s rice has completely ruined all other rice for me and I’m not being dramatic one little bit! I also love Raita. This is a yogurt based condiment with mint, coriander, and cumin. I love it on my rice. I don’t think that’s the traditional way to use Raita, but it’s my signature thing. 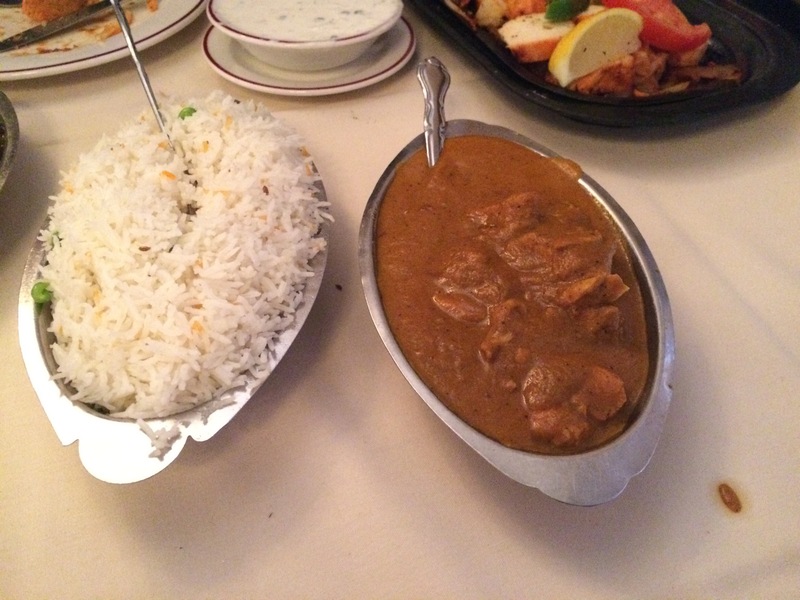 If you’ve never eaten Indian food, keep in mind that it might not look pretty, but that’s no indication of flavor. Also, spice level is an important factor when ordering. At Ambar, you order on a scale of 1-6. I like spicy, but don’t enjoy my mouth being set ablaze by my food, so I usually order a three. If you don’t like heat at all, go with a one. Remember, Indian is rich and filling, but it heats up well and is just as good the next day! I often leave leftovers for my hubby, but with Indian, I put up a heck of a fight! Ultimately, here’s what I adore about Ambar- it’s consistently good. I’ve eaten there many times and there’s never been a hiccup. The recipes and techniques don’t change. There isn’t a bad day in the kitchen. I know what I’m getting and I know it’s amazing. I will actually crave Ambar! Keep in mind that this is a small place so you might have to wait a bit for a table. Also, park in back or on the street. If you park in a competitor’s lot, you might be towed and there’s just no fun in that! P.S. If you’ve got time to spare, check out the shops on Ludlow. I love Toko Baru. More time? Have dinner at Ambar, check out the shops, grab a movie at the Esquire, and finish with coffee at Sitwells. Lovely! GO THERE (Ambar)! 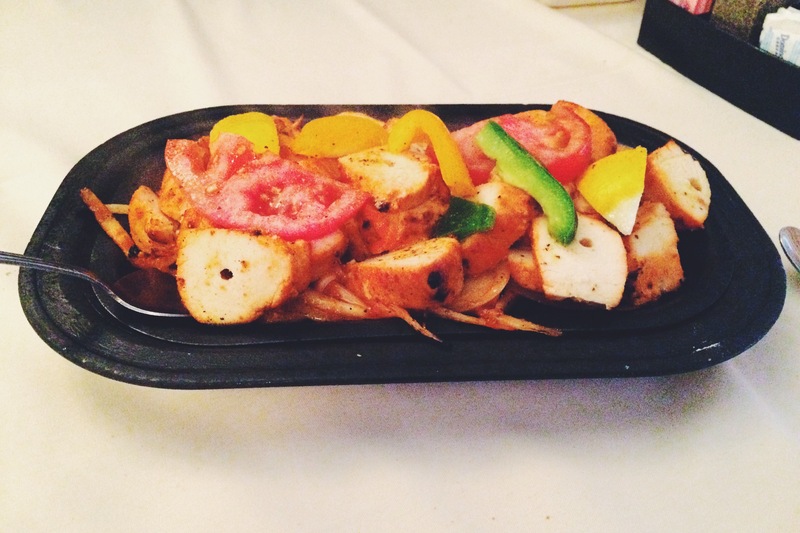 TRY THAT (Chicken Tikka/Chicken Tikka Masala)! One year blog anniversary! | Go There. Try That.